T-R PHOTO BY THORN COMPTON - Former Grundy Center standouts Bryce Flater, left, and Jordan Hook hold a football together on the field at the UNI-Dome during media day last week. The two boys are back together again, trading Spartan jerseys for Panther ones as part of the University of Northern Iowa football team. CEDAR FALLS — For a couple magical seasons, Bryce Flater and Jordan Hook struck fear into the hearts of opposing defenses. Flater had back-to-back 2,000-plus rushing seasons while toting the rock for Grundy Center, and for both of those years Hook was locking things down on the offensive line. 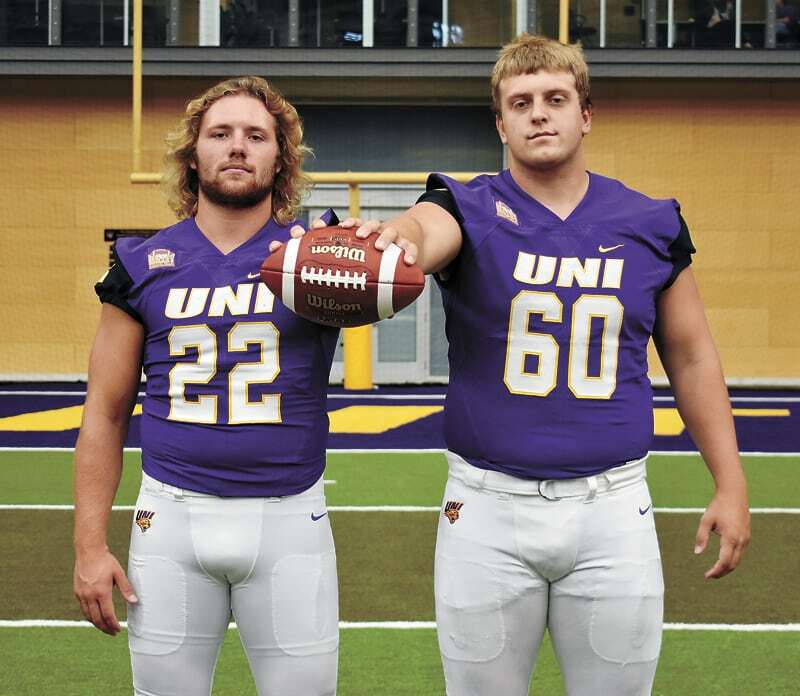 Now the two are back together again just 27 miles north of Grundy Center, where the duo now wear University of Northern Iowa uniforms. Flater, who joined the Panthers last season and enters his first year as a redshirt freshman, said having one of his former teammates and lifelong friends with him on campus is a blessing. Hook, who is in his first year making the jump from the high school to the college level, said joining back up with his former running back was a huge perk in committing to UNI. “Bryce and I have been friends ever since we were little, so he’s been honest with me about everything and it’s been really nice to have him as a resource to use in this whole process,” Hook said. While the two are together again in the same locker room, it is now in a much different context. Flater has made the switch from running back to inside linebacker, while Hook is still working on the offensive line. After redshirting his first year with the team, Flater said he is in a much better position now to possibly contribute on the field. Hook might not be changing positions, but he is going from manhandling players from fellow Class A schools to now facing elite talent. Though UNI has yet to play a game this season, Flater said Hook is getting plenty of experience of what game speed will look like just because of the way the Panthers practice. Flater himself is trying to win a spot on the defense, but he currently sits third on the depth chart at middle linebacker behind West Marshall graduate and Northern Iowa senior Duncan Ferch. 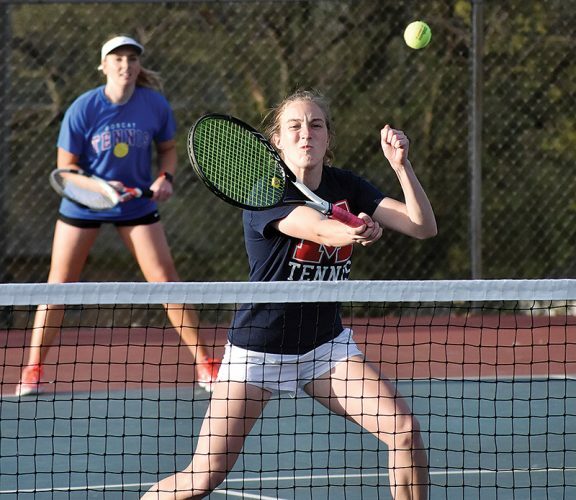 Ferch said he embraces Flater’s work ethic, despite both playing the same position, and he is doing his best to bring the younger NICL West Division athlete along. Hook is also having a bit of a position switch, going from playing tackle on the outside for most of his Spartan career to now playing on the inside as a guard. Whenever Hook needs a bit of a mental break or is feeling a little homesick, he doesn’t just have to rely on the familiarity of Flater on the team, as home is just a short car ride away. Hook is fighting with 18 other linemen for one of five starting spots, and he knows with his lack of experience that he likely won’t be a starter fresh out of the gates. Due to the new rule allowing redshirted players to play in as many as four games, however, Hook said there is a chance he sees some action in 2018. 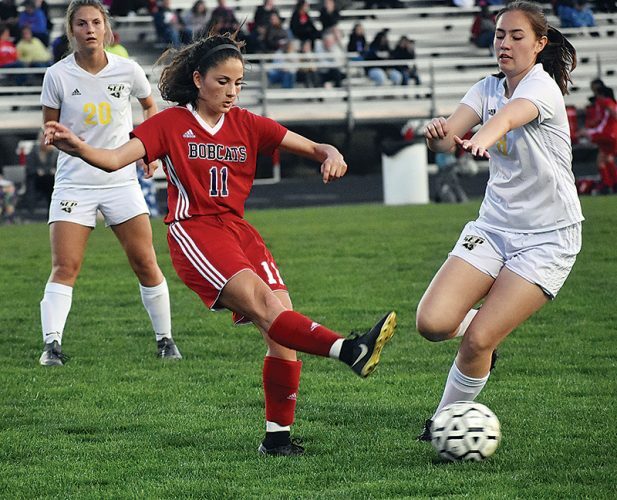 Given both of their roles on their respective sides of the ball, there will likely come times in practice that the two will have to face off in one drill or another. When that time comes, both said they won’t back down from the challenge. 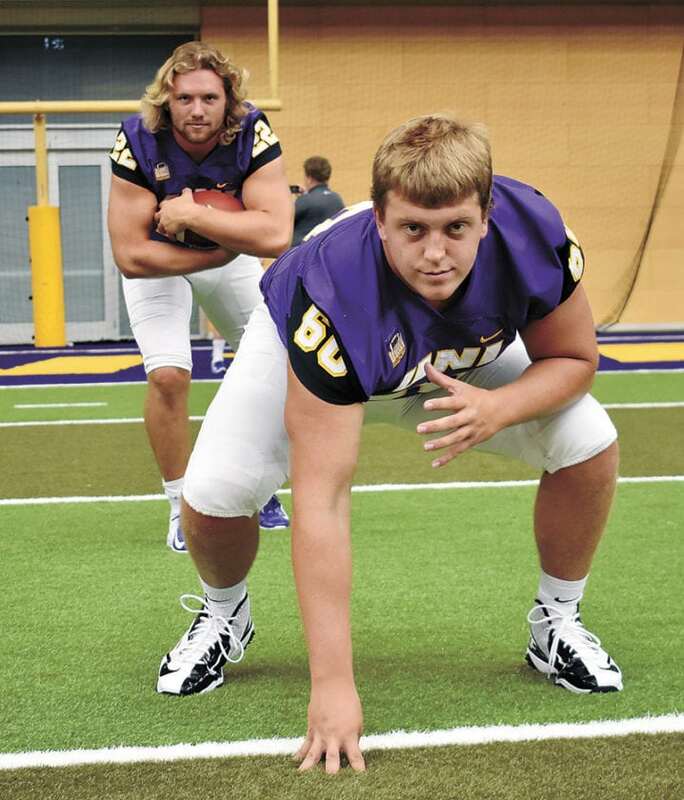 T-R PHOTO BY THORN COMPTON – Former Grundy Center standouts Bryce Flater, left, and Jordan Hook hold a football together on the field at the UNI-Dome during media day last week. The two boys are back together again, trading Spartan jerseys for Panther ones as part of the University of Northern Iowa football team.